Jamestown, a friendly and historic town in Western New York, is now the funniest city in the country—dare we say, the world! Where else can you find two museums dedicated entirely to the art and history of comedy? Beyond this humorous theme, Jamestown and its surrounding area are full of a variety of other fun, with restaurants, nightlife, cultural activities, and outdoor adventures to please the whole family. Jamestown’s exciting renaissance features the brand-new National Comedy Center as well as classics like the Lucy-Desi Museum and the gorgeous Chautauqua Lake for views, boat rides, and performances and lectures at Chautauqua Institution. The surrounding area provides many opportunities for fun day trips from exploring nature in some of the state’s best parks and winery tours to large-scale sculpture parks, ski resorts with year-round activities, and classic amusement parks. 1. The National Comedy Center and the Lucy-Desi Museum: The National Comedy Center is no joke—it&apos;s a state-of-the-art, interactive, and highly personalized cultural destination celebrating the art of comedy. Laugh and learn about all the greats, from Charlie Chaplin and Lucille Ball to Jerry Seinfeld and the stars of Saturday Night Live to modern-day memes, via more than 50 interactive exhibits and immersive experiences. Annual festivals feature top stars. Amy Schumer, Dan Aykroyd, and Lily Tomlin all celebrated the grand opening in August 2018. The Lucy-Desi Museum is just a 5-minute walk away, where you’ll find costumes, props, unseen footage, and more, all honoring Jamestown’s most-famous hometown hero. 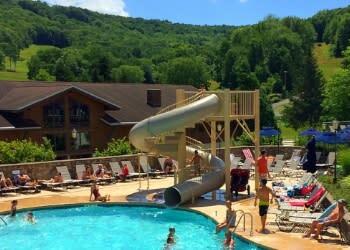 Visit our insider&apos;s guide to the National Comedy Center. 2. Chautauqua Institution: A summer hotbed for culture whether you’re into dance, opera, visual arts, author lectures, poetry, theater, or recreation like golf, tennis, swimming, or sailing. Visitors can stay “on-campus” at the Athenaeum Hotel and more than 100,000 do, each year. Special programs for kids include day camp, sports instruction, cooking and art classes, and a young writers workshop. The season typically runs from late June to late August. 3. 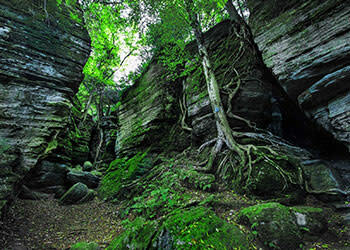 Panama Rocks Scenic Park: You might be just 14 miles west of Jamestown but you’ll feel like you’re in Jurassic World as you wander through this ancient forest with towering 60-foot-high rock formations, crevices, passageways, and caves. Wear shoes suitable for hiking. Open daily, early May through October. Griffis Sculpture Park: One of the country’s oldest and largest sculpture parks, Griffis Sculpture Park in East Otto is unique in that it’s okay to play and climb on the art. Each of the more than 250 pieces have been placed with the surrounding scenery in mind. Midway State Park: If you’ve got young kids (under age 7), don’t miss a trip to Midway State Park, one of the oldest operating amusement parks in the country, having opened in 1898. Find classic amusements like a fun slide, tilt-a-whirl, bumper cars, go-karts, skee-ball, and a Herschell Carousel. Open seasonally. Allegany State Park: The largest state park in New York offers year-round activities from biking, hiking, camping, swimming, tennis, volleyball, playgrounds, and boating, to snowmobiling, snowshoeing, and more than 35 miles of cross-country skiing. Don’t miss the fall foliage. Get ready for the funniest day of your life by having breakfast at Crown Street Roasting Company where even the most hipster of hipsters would feel at home. Celebrate the art of humor, from early Vaudeville to Carol Burnett, Jay Leno, Jim Gaffigan, and the latest viral memes at the new-in-2018 National Comedy Center. 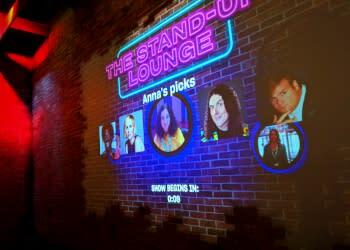 More than fifty immersive exhibits let you battle your friends as to who can keep from laughing the longest, perform live stand-up karaoke, and insert yourself into classic comedic scenes. 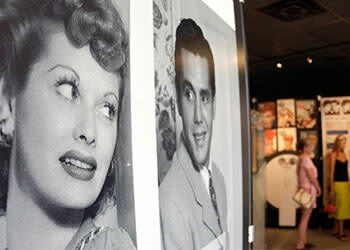 You could definitely spend a full day at the National Comedy Center, but if your crew includes folks who love Lucy, don’t miss the nearby Lucy-Desi Museum. Recreate your own Vitameatavegamin commercial, watch unaired scenes, and view props and sets from I Love Lucy, starring Jamestown local Lucille Ball. Speaking of Lucy, visit Lucille Ball Memorial Park to see two statues of the hometown hero. One was commissioned in 2009 that horrified fans and became a viral sensation, often being called “Scary Lucy.” A newer, shall we say friendlier one has since been installed, but both stand proud along beautiful Chautauqua Lake today. 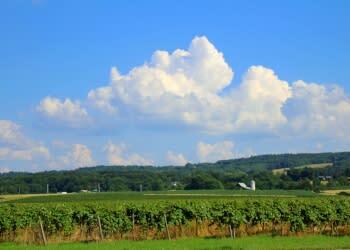 Welcome to Lake Erie Wine Country, the second largest grape-growing region in the country. Try out a few of the recommended wineries like 21 Brix Winery with a nice hot food menu, Johnson Estate Winery, the state&apos;s oldest estate winery (whose wines are made with grapes grown in their own vineyards), or the family-owned Liberty Vineyards Winery. Stop along the route to taste juices and wines at the Grape Discovery Center in Westfield, the official Visitor’s Center for the Concord Grape Belt, and learn about America’s Grape Country. Admission to the center is free and there are activities for children. Make reservations for an eclectic dinner at Forte in Jamestown, rated one of the best restaurants outside of New York City by Thrillist. Make a night of it: Forte is also a cocktail lounge, wine bar, dance club, and art gallery, part of downtown Jamestown’s arts scene. Take an early morning walk amid 27 scenic acres at the Roger Tory Peterson Institute, named for a Jamestown native who was the preeminent naturalist of the 20th Century. See his vast collection of wildlife, art, and photography. Explore fascinating local history, from the Civil War and Underground Railroad to the life of Lucille Ball, at the Fenton History Center, an 1863 Italian-style villa with plush Victorian décor. The opulent Jamestown mansion was home to Reuben E. Fenton, 19th-century entrepreneur, a close political associate of Abraham Lincoln, and Governor of New York from 1865 to 1869. After learning about the history of Jamestown, dive right into the future of it at the brand new National Comedy Center. 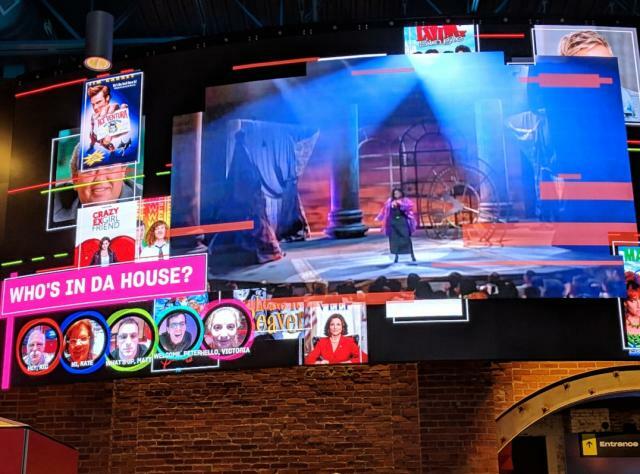 Cutting-edge technology and 50 immersive exhibits let you personalize your experience and explore content tailored to your taste, from satire to slapstick. Try your hand at cartooning or performing stand-up or send your friends “burns” from comedian Frank Castillo. Take in a show. Jamestown features great performing arts, from musicals at the Lucille Ball Little Theatre, to concerts at the Reg Lenna Arts Center or Northwest Arena, which also has year-round ice-skating. If it’s summer, attend a performance at Chautauqua Institution nearby which has hosted everything from ABBA tribute bands to Yo-Yo Ma. Get sandwiches from the Corner Cafe and head 14 miles west to Panama Rocks Scenic Park for an other-worldly experience. Picnic on the grounds, and then hike through an ancient forest of towering 60-foot-high rock formations, crevices, passageways, and caves. Visit Axcellent Adventures on the grounds to try your hand at axe-throwing (it’s recommended kids are at least 8 years olds for this activity). Reward yourself for the hike with Perry’s legendary ice-cream at Lenny&apos;s Ice Cream Shack, three miles away on Panama Bear Lake Road. Founded in 1918, Western New York’s family-owned and operated Perry&apos;s Ice Cream uses fresh milk and cream from local farms to create a creamy delicious product beloved for a whole century. On the way back into Jamestown, visit the Empty Pint, the taproom at Southern Tier Brewing Company, which also offers tacos, sandwiches (grilled cheeses, meatloaf, pastrami, and more), and other pub fare. Treat your senses to the beauty of a morning hike through the woods at the Audubon Nature Center. This 500-acre wildlife sanctuary offers four-season fun with miles of trails, cool nature exhibits, animals, and kid-friendly programs and activities. Trade the sounds of birds chirping to the sounds of laughter at the National Comedy Center where your crew can draw cartoons, make their own memes, and see props and sets from comedy classics. Celebrate America’s past and present stars like Lucille Ball, Robert Klein, George Carlin, Amy Schumer, and Jim Gaffigan. I Love Lucy fans will also want to make sure they visit the Lucy-Desi Museum and Lucille Ball Memorial Park where there are two different sculptures of Jamestown’s most famous daughter. 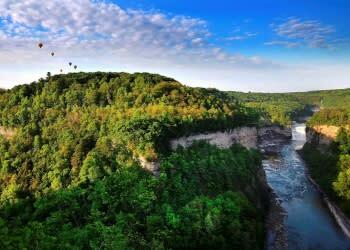 Don’t miss your chance to see the “Grand Canyon of the East” at Letchworth State Park, with more than 14,000 acres of scenery and 600-foot-tall gorges carved by the Genesee River. The drive will take about two hours each way. A few hours visit will only crack the surface of the park, so plan on leaving early from Jamestown to get the most out of this day trip. Your activities at the park will vary by season. Hike all year round and take in the changing leaf colors in the fall. During the colder months, there are snowmobile, cross-country skiing, and snow-tubing trails you can explore, and the waterfalls and geyser sometimes freeze, which is visually stunning. Have lunch or dinner (or both!) at Glen Iris Inn which overlooks the Middle Falls in the park, so you won’t feel like you’re missing out on your quality time with nature. The inn is the former country estate of William Pryor Letchworth, for whom the park is named. In addition to pizza, wings, quesadillas, salads, and burgers, there is a special picnic menu providing bagged lunches if you’d like to grab and go. Today’s day trip, just a 40-minute drive from Jamestown, will be to Allegany State Park, especially gorgeous during the fall season with all of the changing leaves. But no matter the season, you’ll find plenty to do, including biking, tennis, playgrounds, boating, horseback-riding, snowmobiling, snowshoeing, hiking, and children’s activities. Families can also camp in the park. 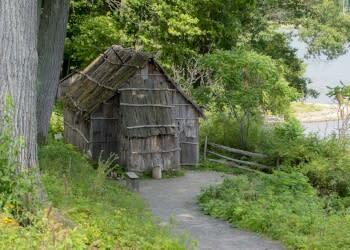 Outside of the park in Salamanca, visit the Seneca-Iroquois National Museum, with a new cultural center as of 2018, and permanent exhibits such as a Log Cabin Room, a Longhouse Room, and an exhibit giving thanks to the birds, animals, and plant life on Earth. The gift shop features pieces from Seneca Nation artists. Visit Amish Country to experience the area’s natural beauty and tranquility. From Jamestown, it’s a 16-mile drive along scenic Route 394 to Randolph, the start of New York’s Amish Trail; get a map at the welcome center. Between Randolph and Gowanda, more than 100 farmstands and shops sell traditional crafts, quilts, and furniture as well as fresh-baked goods, artisan cheeses, and homegrown fruits and vegetables. As you drive, keep an eye out for slow-moving, horse-drawn buggies. If it’s spring, switch gears and go whitewater rafting on the Cattaraugus River through Zoar Valley with either Adventure Calls Outfitters, Inc. or Zoar Valley Canoe & Rafting. Head back to Jamestown, where Forte features Thursday night specials—all-inclusive steak & beer dinner deals, sushi platters, and dollar-off drafts of local Southern Tier Brewing Company on tap. Drive an hour to Griffis Sculpture Park where you’ll find more than 250 large-scale outdoor sculptures that the kids (or grown ups) can even climb on, if the desire arises. Nearby at Holiday Valley Resort, ride the Sky Flyer mountain coaster with 15 curves, 12 waves, 1 jump, and a large circle/spiral and explore on the Sky High aerial adventure course. Of course, if it’s winter, you can spend the whole day skiing or snowboarding. Stop in the charming town of Ellicottville for lunch, dinner, and some brews at the popular Ellicottville Brewing Company. Head up to Lake Erie and climb the Dunkirk Lighthouse and Veterans Park Museum. The 1875 lighthouse is open to tour from May to October. Point Gratiot Park nearby is a great free beach on the lake with swimming, beach-glass hunting, pavilions with grills, and more. 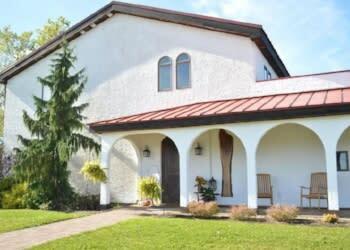 Try a few of the wineries in this rich grape-growing region of Lake Erie Wine Country including Five & 20 Spirits/Mazza Chautauqua Cellars, Merritt Estate Winery, and Noble Vineyards. Visit the Grape Discovery Center where kids can participate in non-alcoholic grape juice tastings. Explore the charming village of Bemus Point on your way back to Jamestown. You’ll find some of the best ice cream in the area at Bemus Point Market as well as great shops and restaurants. Visit Long Point State Park where, depending on the season, you can swim, hike amid spectacular fall foliage, or cross-country ski. Swimmers will want to wear water shoes due to sharp mussel shells. Fish for bass, pike or Chautauqua’s famously huge muskellunge (muskies) that must be at least 40" to keep. Lawson Boating Center is a fun place for kids, with antique boats, a restoration workshop, and activities. Back in Jamestown, unwind at Brazil Craft Beer & Wine Lounge, serving beers and wines from the neighborhood and around the world. They also feature an eclectic and hearty vegetarian dinner menu. If Chautauqua Institution is in season (typically late June to late August), take in a lecture or performance, get a sailing lesson or play golf, stroll through the art galleries, dine at the Athenaeum Hotel, or try any of more than 20 other activities along Chautauqua Lake. On Sundays there is free gate entrance and free parking until 2 pm. Book a historical tour on the Chautauqua Belle, an authentic Mississippi River-style sternwheel steamboat, built in the 1970s. You’ll hear stories of the surrounding area from the late 1800’s while cruising Chautauqua Lake for 90 to 105 minutes. Make it a Sunday Funday if you have young kids with timeless amusements at Midway State Park on Chautauqua Lake. Ride the vintage carousel, go-karts, and bumper boats. Take a spin on the tilt-a-whirl, play a game of mini golf, and test your skills at classic midway games. It’s also is a great place for fishing. 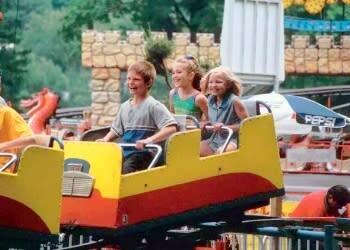 Established in 1898, one of America’s oldest amusement parks, Midway is still a family favorite. Comfort Inn Jamestown Falconer: Clean comfortable rooms; free wifi, parking, and breakfast buffet, fitness center; pet-friendly rooms. Two miles from the National Comedy Center. TripAdvisor Certificate of Excellence. DoubleTree by Hilton Jamestown: Newly renovated hotel in historic downtown; family suites, indoor saltwater pool, fitness center. Walk to the National Comedy Center and Lucy-Desi Museum; near ice-skating at Northwest Arena and concerts at Reg Lenna Arts Center. Hampton Inn & Suites Jamestown: Clean, comfortable rooms; near historic downtown Jamestown. Fitness center, pool, free breakfast. TripAdvisor Certificate of Excellence. The Oaks Bed & Breakfast Hotel: Charming setting in Jamestown; ten lovely guestrooms, common rooms, fine amenities. Open to adults and children age 12 and older. Close to Jamestown attractions. Great breakfast, shaded outdoor patio. Holiday Inn Express Jamestown: Five minutes from Lake Chautauqua. Heated pool. Close to several restaurants. Chautauqua Harbor Hotel: Brand-new luxe hotel that opened in the fall of 2018 on scenic Chautauqua Lake; in Celoron, three miles from downtown Jamestown. 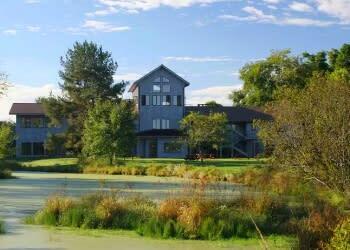 135 guest rooms and suites, many with lake views. Restaurant, bar, indoor and outdoor pools, fitness center. Patio overlooking the lake. 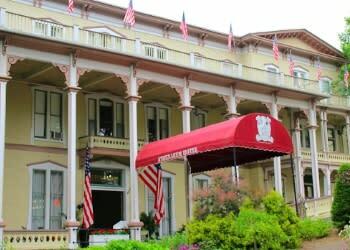 The Athenaeum Hotel: Full-service Victorian grande dame, 17 miles north of Jamestown. 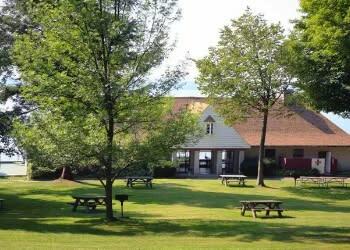 On the grounds of world-famous Chautauqua Institution; overlooks the lake. During the Institution’s summer season, hotel guests receive a gate pass to enjoy world-class arts, recreation and entertainment, a tradition for 140 years. Buffet breakfast on the patio overlooking the lake is a must. The hotel is also open in spring and fall. 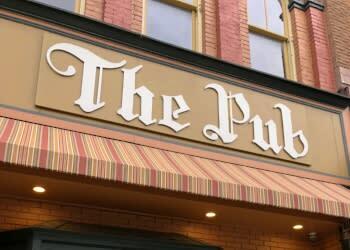 The Pub: Home cooking since 1965: soups, pasta, and regional specialties like Beef on Weck. Spirits, wine, and local craft brews. Cash only. Havana Cuban Café & Pizzeria: Authentic Cuban specialties: completas, sandwiches, pizza. Rich Cuban coffee, tres leche cake, and flan. On Main Street, near the Lucy-Desi Museum; family-owned, it consistently rates five stars. Not open for dinner. Pace’s Pizza: A local favorite for simple thin-crust pizza with a sweet homemade sauce. Limited hours—4 pm to 8 pm Tuesday through Thursday and until 9 pm Friday through Sunday. Closed Mondays. Reservations recommended. Crown Street Roasting Company: Local family business; wide variety of coffees, all roasted in-house and ground fresh. Espresso, cappuccino, latte, teas, chai, and steamers, plus fresh-baked goods. Labyrinth Press Company / Brazil Craft Beer and Wine Lounge: On the lower level, Labyrinth Press Company offers vegetarian fare, coffee house, and live music. On the upper level, Brazil Craft Beer and Wine Lounge boasts Jamestown’s largest drink selection. You’ll find the same menu of cheese plates, burritos, sandwiches, soup, and pizzas on both levels. Pro tip: Saturday brunch. The Cherry Lounge: Jamestown holds its own to Buffalo with the Cherry Lounge’s chicken wings—try the garlic-parmesan variety or the cajun-parm medium. The pocket sandwiches are also recommended. Shawbuck’s Press Room: Family-friendly restaurant with live entertainment, fresh salads, home-style chicken & biscuits and meatloaf, luscious desserts, and craft cocktails. Right next to the National Comedy Center. Sauce on Main: Sicilian-style pizza and Italian classics with modern twists. Taco Hut: Made-from-scratch Mexican fare since 1972. Thursday night is “Family Night” with ½ priced kid’s meals and ½ priced soda (or pop) pitchers, and other nightly specials. Closed Sundays. 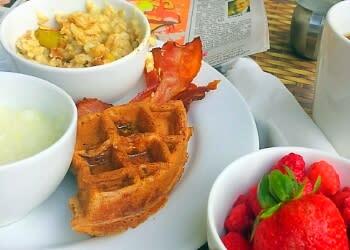 Main Landing: The only spot for Sunday brunch in Jamestown. Outdoor waterfront seating. Entrees include salads, burgers, sandwiches, seafood, pasta, chicken, and steak. Homemade desserts. Closed Mondays. Forte: Eclectic American cuisine created with local products. Sushi available, with special platters on Thursdays. $14 steak and beer is an everyday special. Inviting décor showcases local artists. Landmark Restaurant: Beautifully renovated; classic cuisine with an innovative approach; creative cocktails and local brews. A more casual bar and lounge. Gialy’s Bar & Grill: Fine dining. Steaks, seafood, and fresh pasta, prepared by a creative chef. Great for families, friends, or romantic dates. Scenic views of downtown Jamestown. Heirloom: The Athenaeum Hotel’s formal farm-to-table dining experience is only open during the 9-week Chautauqua Institution season (late June to late August). The White Carrot: Fine dining near Chautauqua Institution with prix-fixe menu and small plates. Vegetarian- and vegan-friendly. Celebrities from the small town of Jamestown include comedian and actress Lucille Ball, U.S. Supreme Court justice and Nuremberg chief prosecutor Robert H. Jackson, naturalist Roger Tory Peterson, singer Natalie Merchant, and NFL Commissioner Roger Goodell. The Lake Erie Concord Belt is the oldest and largest Concord grape-growing region in the world and this region is the second-largest producer of grapes in North America after the Napa Valley. In 2009, a 400-pound bronze “likeness” of Lucille Ball was put on display in Lucille Ball Memorial Park in Celoron. It didn’t look like the hometown hero and there was quite a backlash from fans, who called the sculpture “Scary Lucy.” In 2016, a more realistic statue was installed. Both are displayed at the park today. By Train: Travel Amtrak from Toronto, Albany, or New York City to Buffalo’s Exchange Street station (BFX) downtown. Then take a bus to Jamestown or rent a car and drive. 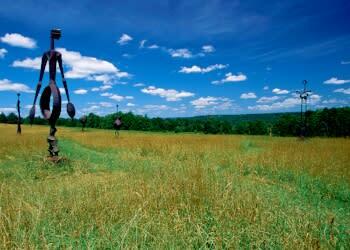 Find more ideas and information at Chautauqua County Visitors Bureau and Up Close Jamestown.